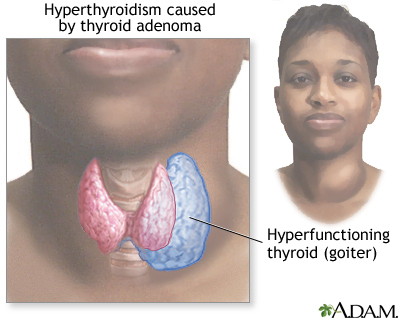 A goiter is a swelling in the neck due to an enlarged thyroid gland. The size may range from a single small nodule to a large neck lump. The swollen thyroid can put pressure on the windpipe and esophagus which can cause a cough, wheezing, breathing difficulties or swallowing difficulties. A goiter only needs to be treated if it is causing symptoms.